Der Artikel Ray Celestin: The Axeman's Jazz wurde in den Warenkorb gelegt. New Orleans, 1919. As a dark serial killer - The Axeman - stalks the city, three individuals set out to unmask him. Detective Lieutenant Michael Talbot, heading up the official investigation, and harbouring a grave secret, is struggling to find leads. Former detective Luca d'Andrea, working with the mafia, whose need to solve the mystery of the Axeman is every bit as urgent as that of the authorities. Meanwhile, Ida, a secretary at the Pinkerton Detective Agency, stumbles across a clue which lures her and her musician friend, Louis Armstrong, to the case and into terrible danger . 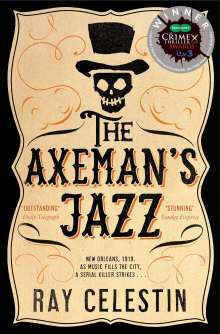 . .
As Michael, Luca and Ida each draw closer to discovering the killer's identity, the Axeman himself will issue a challenge to the people of New Orleans: play jazz or risk becoming the next victim.